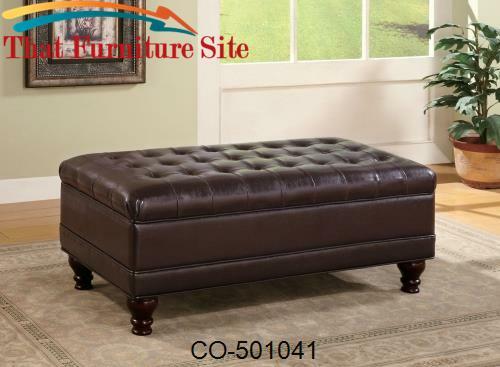 This beautiful storage ottoman will blend nicely with your elegant traditional living room decor. The sophisticated piece has a plush oversized top cushion, with classic tufting in rich dark brown faux leather. The ottoman offers a comfortable place to rest your feet, and lifts to reveal a large enclosed storage area that is perfect for blankets and pillows, reducing the clutter in your space. Distinctive welt cords around the base, and stunning turned wooden feet complete this gorgeous style. Add this wonderful piece to your living room for a comfortable and stylish traditional look.